Please note that the content of this book primarily consists of articles available from Wikipedia or other free sources online. 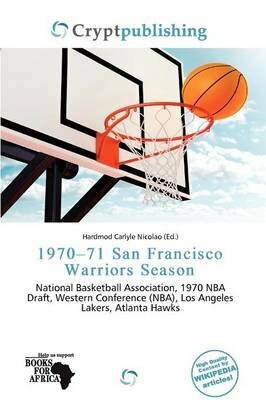 The 1970-71 NBA season was the Warriors' 25th season in the NBA and 9th in the San Francisco Bay Area. The 1970-71 NBA season was the 25th season of the National Basketball Association. The season ended with the Milwaukee Bucks winning the NBA Championship, beating the Baltimore Bullets 4 games to 0 in the NBA Finals. Three new teams made their debut: the Cleveland Cavaliers, the Portland Trail Blazers, and the Buffalo Braves.